Stacy Tilton Reviews: You can't go wrong with ALEX Brands! You can't go wrong with ALEX Brands! I honestly think the title says it all..."You can't go wrong with ALEX Brands!". I mean honestly you can't go wrong when shopping their hundreds of crafts and toys for all your kid friendly gifting needs. I love that they have something for boys and girls of pretty much every age range. Most brands only carry gift ideas for a limited age span, not ALEX Brands they have it all! Just check out some of these hot ideas my 10-year old daughter and I came up with as being her favorites. Super Sweet Umbrella makes it fun to go out walking in the rain. With images of cupcakes, lollipops, candy bears, ice cream cones and more you’ll want to stand out in the rain and stare at your umbrella. Your favorite treats are decorated in your favorite colors, because you made it yourself! Includes 24" diameter preprinted umbrella and 6 weather proof markers. Knot-A-Quilt Chevron is a unique way to make a beautiful throw or blanket without stitching! All of the shapes come with pre-cut edges to be tied together, creating a useful and artistic project. Just choose the order you want the colors to be arranged in and knot away! You’ll soon have a bright blanket perfect for taking naps or to keep you cozy while binge-watching your favorite programs! Finished quilt measures 49.5" x 60". Includes 18 pre-cut soft polyester fleece 18" x 18" shapes and easy instructions. Sweetheart String Art takes string art to the next level. Decorate with pom poms, shimmering yarns, gold beads and shiny faux leather feathers! Make a 22". super-fun dream catcher without using pins or nails. With the unique plastic mold you just wrap the colorful yarn around the frame, decorate and hang. Includes 11" x 11" plastic notched hoop, 4 colors of yarn, 20 metallic pony beads, 5 metallic faux leather shapes, plastic needle and easy instructions. Fab Foil Nail Roller puts sparkly color right on your nails without using a brush. Just roll on some color, decorate with a sticker and brush on some topcoat to protect. Create shiny two-tone effects by rolling on a second color! Includes nail roller, 30 foil strips, clear nail polish, 2 sheets of adhesive double sided nail stickers 5.5" x 6.5", storage pouch and easy instructions. Grow Crystal Jewelry gives a young jewelry maker the unique experience of growing their own stones. 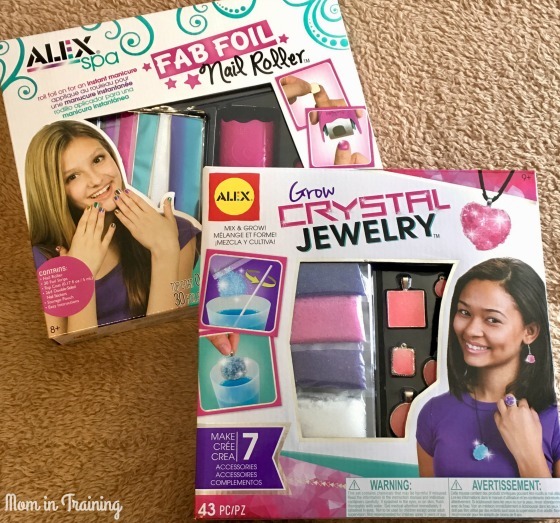 Just mix up the crystal powder and pour it into a jewelry finding, and like magic a colorful crystal will grow—right on the jewelry! Make pendants, a necklace, earrings and a ring. 8 pieces in all! The kit includes 6 crystal powder packets, mixing bowl, 6 plastic cups, 6 stir sticks, sheet of duct tape stickers, 4 pendants, 1 ring, 2 earrings, jump rings, 2 earring hooks, satin cord and easy instructions. 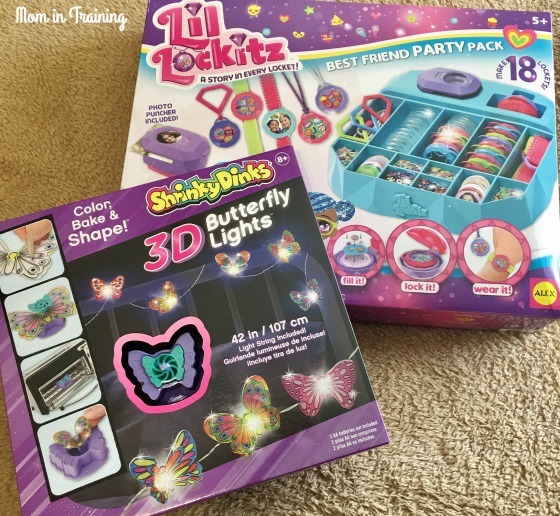 Lil' Lockitz Best Friend Party Pack by ALEX Toys lets you express yourself as never before to create something truly personal, for yourself or a loved one. Lil’ Lockitz supplies you with gems, backgrounds and charms of your favorite things to float in a wearable collage that tells a story. Just fill it with custom charms of things you love, lock it up when everything is in place and wear it as a necklace, bracelet or use the Keychain Clasps to make clip-ons! Includes 18 Locket Tops, 18 Locket Backs, 6 Necklaces, 6 Bracelets, 6 Keychain Clasps, 72 Charms, 54 Gems, 32 Backgrounds, 1 Pack of Sequin Letters, Tweezers, Photo Stencil, Locket Crimper, Photo Puncher, Storage Tray and Easy Instructions. Shrinky Dinks 3D Butterfly Lights turns your bedroom into a butterfly habitat that lights up! Color and shrink your butterflies and attach them to the battery operated string of lights. With the custom colors you choose, the set adds a unique and lighthearted atmosphere wherever they’re placed. Requires 2 AA batteries, not included. Includes Butterfly silicon mold, LED string with 10 LED lights, 8 color pencils, 14 pre-cut and preprinted butterflies, 12 glue dots and easy instructions. ALEX brands even has an awesome French line that is sure to keep kids entertained and learning at the same time. 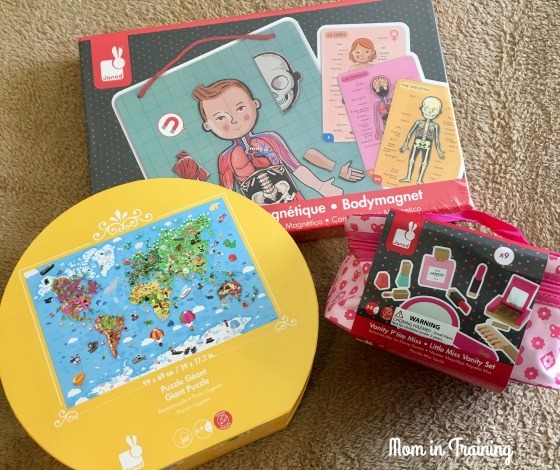 I love toys that help kids learn as they play. I sure wish I had known about their cute Little Miss Vanity Set when my daughter was younger. I could honestly see her playing pretend make-up with it all the time. Instead we are working on putting together the giant puzzle and talking about all the fun places around the world. (You can't go wrong with ALEX Brands!) Wow! 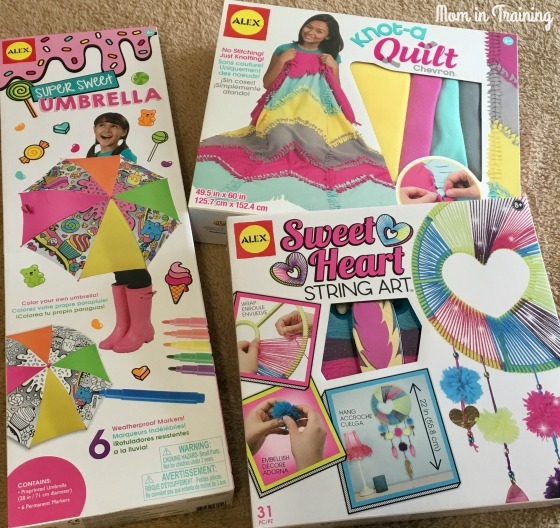 So many great things for the girls to make and enjoy. I know a little girl that would really like these. These are cute. I just saw some embroidery kits for young kids I thought were nice too. I like the Janod body magnets. Totally different than anything I've seen for kids lately. The same with most of the Alex lines...loving the french style. These look like all super fun projects. This kind of thing is so good for teen girls - to occupy some of their energy! I love things like this that encourage kids to be creative. I know a little girl who would love these!